Feb 03: It used to be a case of beware of Greeks talking up their wines but that has all changed, says our Australian guest writer Dan Traucki who investigated into this myth and discovered that although they were producing mundane wines earlier, with modern winemaking techniques coupled with unique ancient native grape varieties, they are making some really interesting wines. For much of the last century there was a myth around that Greek wines were really good. The reality was that unless you were a retsina aficionado (very much an acquired taste) they were mainly rustic wines – being slightly oxidised whites and musty reds. 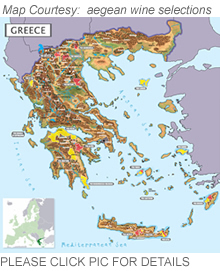 The myth was perpetuated by Greeks living abroad, like my dear father-in-law who proclaimed that almost all the good things in this world were a Greek invention, and by Euro holiday makers who guzzled gallons of fresh young Greek white wines while sunning themselves on the shores of the Aegean. 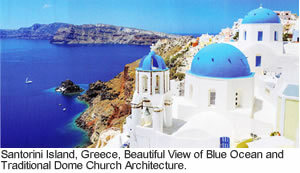 (No town in Greece is more than 130km from the sea.) So I decided to do a “Myth Busters” investigation into this myth. In recent times and especially since the tourists stopped coming to Greece because of the Global Financial Crisis, there has been a dramatic transformation in Greek wines. It has improved in massive leaps and bounds, and is now good enough to be and is in fact being exported around the world. Today using modern winemaking techniques coupled with unique ancient native grape varieties, they are making some really interesting wines. While wine has been made in Greece for eons, it is only in the last 30 years that the modern Greek wine industry has come into being. Until then there were around 30 big wineries and co-ops that processed all the grapes into what could only be described as fairly mundane wines. Many of their native white varieties are prone to oxidation and thus a fair amount of Greek whites were slightly brown and not very palatable. Since then, while the area planted to vines has hardly grown, the number of wineries has risen to around 500 as artisans joined the industry. Thus there are a lot more winemakers adding their own TLC (tender loving care) to the wines today, than there were 30 years ago. At the same time most of the newcomers, being younger and more dynamic, embraced modern winemaking technology so that the oxidised white wines that I remember from my early wine drinking days, are a thing of the past, especially among exporters who today are keenly aware of what the rest of the wine drinking-world is looking for. Greece in total produces around about the same quantity of wine as Bordeaux does, so it is not a “big” player in world terms. Not surprisingly given its climate, Greeks drink more white wine than red and their reds are light to medium-bodied, not like the Aussie big, full-blown style reds we are accustomed too. Greece has around 250 native grape varieties, which added to the linguistic challenge of the varieties names, causes a marketing nightmare. Thus many wineries have decided to focus on a few rather unique native varieties to promote to the rest of the world. In the whites, the focus is on Assyrtiko, Rhoditis and Malagousia. Assyrtiko is the star of the Greek white wine firmament. It is a low yielding, thick skinned variety with amazing acidity. The pH of most of these wines is between 2.6 and 2.9, giving them a crisp, steely acid finish, which makes them a fantastic partner with seafood. Jim Barry Wines in the Clare valley was the first Australian winery to plant assyrtiko here about two years ago. So while you are waiting for its vines to mature and produce its first wine, keep a look out for and enjoy some of the lovely Greek wines available now such as the Gaia 2012 “Thalassitis” from the island of Santorini. This wine has a bright, lively colour, a powerful aromatic bouquet and on the palate, and alluring minerality with flavours that linger on a long, crisp finish. Among the other white varieties which are starting to wave the Greek flag is malagousia, which has light muscat-like characters of apricots and lime. While making a pleasant wine on its own, it really adds character to blends with other varieties such as roditis, like in the Kir Yianni 2013 Petra. If you are interested in trying the unique, a truly fascinating wine I have recently tasted is the Lyrarakis 2013 Dafni (grape variety), which has a beguiling floral nose with hints of rosewater and star anise on the palate – completely different to any other wine I have ever tasted. Yet another interesting native white grape variety is Vilana, which makes a very pleasant light wine that goes really well with seafood. However, when vilana is given the Rolls-Royce-treatment as with the Lyrarakis 2013 Single Vineyard – Barrel Fermented Vilana, you get a superb wine with great aromas and much more depth of flavour, a truly outstanding white wine. 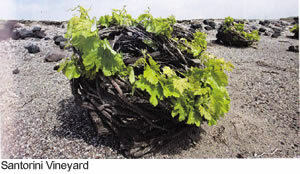 Within the Greek wine industry there is a totally unique grape growing environment on the island of Santorini. 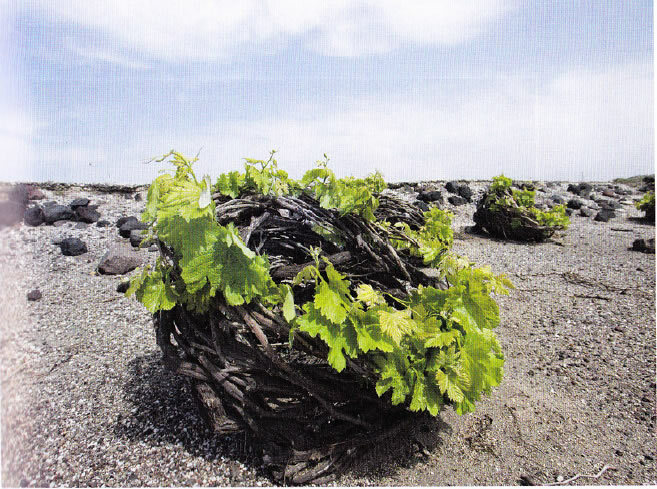 As Leon Karatsalos from Gaia Wines explained, on this island the vines are “basket” or “birds nest” pruned, hugging the ground of this extinct volcano so that they are not seared by the strong and often hot winds that blast the island. As all the soil on the island is volcanic, there is little to no organic matter in it thus no concerns for the usual pests that trouble other grape growing areas. This infertile soil along with the unique trellising system means that the yields are extremely low – down to one to two tonnes per acre, producing extraordinary and uniquely flavoured wines. The wines from Santorini stand out from the rest of the Greek pack due to their greater depth and intensity which comes from growing in such an alien and hostile environment. In terms of Greek red wines, Agiorgitiko and Xinomavro (pronounced Shi nomero) are the stars, ably supported by several of the other lesser known native varieties. Kir Yianni winemaker, Lambro Papadimitrou, makes some excellent xinomavro wines especially the Kir Yianni 2010 Ramnista which has distinctive aromas of strawberries and plums, a wonderful depth of complexity and high acidity thereby strongly supporting the argument that xinomavro is the Greek equivalent of Italy’s nebbiolo. Like other lighter bodied but well-structured reds such as pinot noir and nebbiolo, xinomavro has the ability to age a long time. The Kir Yianni 1997 Ramnista at 17 years old, was quite light brown/onion-peel coloured but had lovely smooth, bottle-aged complexity with a wisp of tomato characters and a grippy acid finish that would make it an ideal food wine. Another red Greek native variety which I would recommend trying is Madilari – the Lyrarakis 2010 Madilari is a big flavoured, rich, smooth wine and it finishes with some lovely grippy tannins, making it a great food wine. As is the case with Portuguese wines, some of the best wines made from native varieties are blends of several varieties designed to achieve certain flavours. A great example of this is the Tsantalis Rapsani Reserve 2010 made from Xinomavro, Krassato and Stavroto (try saying it quickly three times!). This wine has a slightly oaky nose, a beautiful mouthfilling, rich palate with a hint of fruit sweetness and a superb lingering finish. In my quest to prove the myth I discovered that it’s not only the wines made from native Greek varieties that have improved out of sight in recent times, but also the wines made with “international” varieties such as cabernet sauvignon. The Lyrarakis 2008 Cabernet Merlot is a huge wine needing decanting for the fruit aromas to emerge past the predominant oak – it is big-bodied and still very tight (it won a trophy at the 2013 Berlin Wine Show). At six years old, this wine has ages to go before it hits its best and is without doubt the best cabernet merlot I have tasted in the last few years. To round off a perfect meal it would be hard to go past a glass (or two) of Lyrarakis Malvasia of Crete, a beerenauslese style (rather than botrytis affected) dessert wine which is ever so easy to drink. Cap this off with a glass of vinsanto from Santos Wines, which tastes like a good light, sweet tawny but in fact has only 10.5 per cent alcohol because it is made from sun semi-dried grapes and hasn’t been fortified, so you can have a decent sized glass of it. Here is one myth that has now been proven to be correct – the Greeks do make some seriously good wines. So when you have the opportunity, try some Greek wine, especially with food – you won’t regret it.